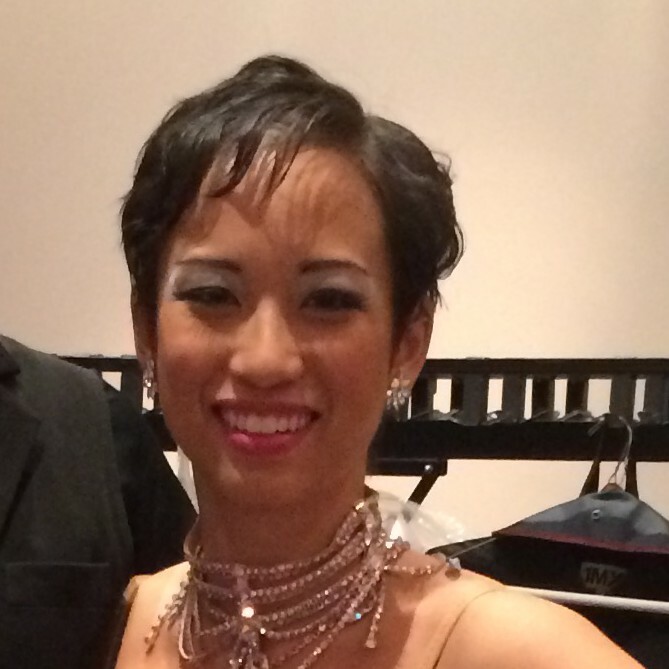 Well, I had written the post on ballroom hair and discussed short hair before having personal experience with it. I’ve had about shoulder-length hair more or less all my life, until last summer, during which I chopped it all off into a pixie. Why not, right? For dance, it’s been a mix of experimentation and struggle with regards to how to deal with it. So, here are some things I’ve tried and also some other options I have yet to attempt. Option 1: Gel/slick it back with a comb, then a boar-bristle brush, spray the everloving crap out of it, and stick on something shiny. Use a hairdryer on hot to seal everything in place, in between layers of product. It’s relatively safe, but I run the risk of those scalp lines cause I have such thin hair. It is basically the same as a normal ballroom bun without the bun part, I suppose. Then stick on one of those stoned ornament things for ballroom. I pinned it with mini bobby pins for this comp over my side part, but found out later than I really should just glue it onto my head with WASHABLE white glue (Elmer’s, the stuff kindergarteners use for crafts). Don’t worry, it just kind of dissolves in a hot shower. Please excuse my slightly crazy facial expression. Option 2: No gel, just lots of spraying in place. Leaves more volume, but less control. This worked for one of the days at my last competition, but then the second day, because I had not washed my hair that morning and was attempting to tame bedhead, the hair got a little wild in the back, at least by the end of the day. Ick. I think with more attention, this could have worked alright. It’s less shiny, however. Same deal with the hair ornament. You could also stone your part or put in designs manually, but I’m lazy. Option 3: Add lots of product and texture. Waves/curls/whatever, which in this case was achieved with hair wax (TIGI Bed Head for Men Matte Separation, which I usually use every day for texture) and a small-barrel curling iron, then tons of freezing spray (I recommend Aussie, Tresemme, or got2B, and these are relevant to all of the above styles). Got a lot of compliments with this one, even though I thought it was just okay. It’ll need some more practice. Pinned-in shiny hair ornament did not stay put, and I actually had to toss it off in the middle of a round because it was just swinging around. Champ girl (who won) at the MAC had a cool hairdo. She had like a long pixie or short bob, I think, and slicked it all back and wrapped a wide headband with a flower on it around her whole head. It matched her dress and was surprisingly cute. Grow out into a short bob, long enough to gel back and create a stubby ponytail, then stick on a hairpiece/fake hair. Will probably have to go this route soon-ish, as I’m planning on growing my hair out this summer. Pin curls or something along those lines? I think you’d need a long pixie for that though. I would loooove to try finger waves, but am incapable of doing it myself, and I think only some hairdressers have that skill. For rhythm/Latin you could do the same styles, or just have a lighter touch of spray, because it’s fine to have your hair moving around for those dances. A spiky look could also be fun, and cool asymmetrical cuts are also popular. Freed Holly Latin shoes at Danceshopper. Marked down to $59 from $119, in a wide variety of sizes. I have never tried these, personally, but my first two pairs of Latin shoes were Freed, and they were pretty good and cheaper for the UK brands. This seems like a steal! Capezio Lorelei Latin/social shoes at Danceshopper. Marked down to $70-ish from $250. They’re kind of crazy, but maybe you want them for a performance or social dancing. Not generally recommended for competition purposes, but if you’re a unique person, do you! 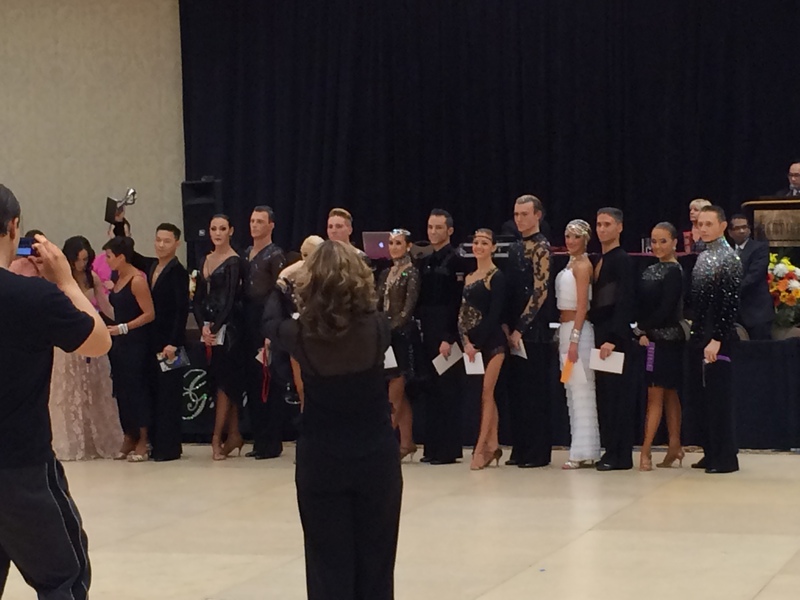 Capezio Jemma Latin/social shoes at Danceshopper. Marked down to $70-ish from $209. I think the white/silver ones are pretty nice for social dancing or maybe even for competitions if you are super super pale. IDS Tanya Latin shoes at Danceshopper. Marked down to $77 from $119. I think this is a solid brand, though I’ve never tried them. Very basic but pretty criss-cross-strap Latin shoe, works for competition. Supadance 1029 from Danceshopper. T-strap Latin shoe, comes in a variety of colors, sizes, and heel heights, priced from $87-$115. Ray Rose Monsoon in size 8 (UK), 3-inch heel, from Back Bay Dancewear. $60. Very specific, but an awesome deal on a great shoe. Normally 2.5-3-times in price. Freed Valencia practice shoes, slip-on style, 1.5-inch Cuban heel, from Danceshopper. Marked down to $59 from $118. I have a similar model that laces up instead, Roma, that I like a lot! I’m on my second pair of those. Werner Kern Laura standard court shoes from Back Bay Dancewear, $79. Haven’t tried this brand, but I’ve heard good things. Supadance 1012 standard court shoes with instep strap, from Danceshopper. $104-$126 from $149. These are pretty popular, but I prefer the diagonal strap of the 1004s. The security of the strap is really nice. Supadance 1008 standard elasticized court shoes with round toe, from Danceshopper. $110-ish from $149, only comes in smaller sizes. I had a pair of these and they were nice, just weren’t the right fit for my foot. They’re quite popular. Supadance 2003 standard pointed-toe court shoes with wraparound strap, from Danceshopper. $110-ish from $149, smaller sizes. These are a newer model, I think. Embossed lace dress from e.K.Clothing, $27, medium in black/jade. Good syllabus USA Dance-friendly option with no sparkles. Tulle Standard/Smooth Dress from Light in the Box, $62 from $155, variety of colors and sizes. Freed Latin Competition Shoes, from Danceshopper. Marked down to $69-80 from $138. Wide variety of sizes, though it looks like most of them are wide-width as opposed to regular-width. Freed Standard Practice Shoes, from Danceshopper. $69 from $138. Lots of sizes. Satin tie from e.K.Clothing, $4, in a variety of colors, to match your partner’s outfit or just add some general schnaz. Danceshopper.com sale section. US site that should have quick shipping on in-stock stuff and I believe you can still return sale items just kidding, clearance is FINAL SALE, so make sure you want it. I ordered some men’s shoes from here recently that got stuck in customs for over a month, but I don’t think that’s normal? DuoDance – (UK) They claim that their sales will end, but there is ALWAYS a sale going on. Also, relatively fast shipping for overseas. Light in the Box (China?) sells all sorts of stuff. Quality is probably all over the place, but they have some pretty good designs and are very inexpensive. I bought a bridesmaid’s dress from them recently, and it was of surprisingly high quality and quite cheap. I think things take a while to get made and ship to the US. They have some insanely cheap costume dresses (under $100) that you could use for collegiate comps. I would probably not get shoes from there, though. VE Dance (US). Vince and Daisy are local, very nice, and have established themselves as makers/importers/makers/whatever of quality bargain dancewear – it’s less expensive than the luxury brands but very nice stuff. And thus super popular among collegiate dancers and recent graduates. They also travel quite a bit, so you can try on stuff in person. 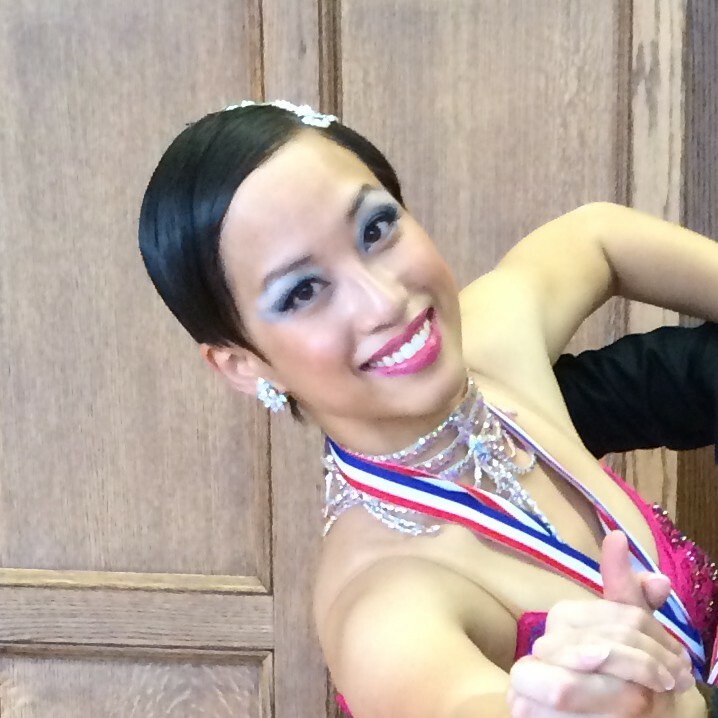 Dancesport.co.uk (UK) sale shoe section and sale apparel section. Lots of good stuff, clunky-looking website, but very helpfully organized by size. Haven’t ordered from here, personally, but I’ve heard they’re good. Cherry Culture sale makeup – they sell mostly NYX, which is a great bargain brand and has lots of ballroom-y bright colors. Well, I would’ve done my own post, but this one is so good, I’m just going to pass it on to you. Enjoy!